Pro-democracy activists in Cuba say a leading dissident Jose Ferrer has been arrested after meeting European diplomats in the capital, Havana. The activists said they did not know where Mr Ferrer had been taken. They have also reported other arrests and intimidation from the Cuban authorities, ahead of a regional gathering of heads of state next week. Mr Ferrer was planning to attend an unauthorised meeting of dissidents during the summit. "He was detained late on Friday near my home, where he had been a guest," Elizardo Sanchez, the leader of the illegal but tolerated Cuban Human Rights and National Reconciliation Commission (CCDHRN), told the AFP news agency. He said that at least eight other activists had been arrested, most of them temporarily, and that they were being targeted because of the international gathering, which opens on Tuesday. "We fear that a wave of political repression has started ahead the summit, especially in the west of the country," near the capital, he told Efe news agency. The BBC's Sarah Rainsford in Havana says it has become normal practice to detain people to warn them off or keep them out of the way of an event. The United Nations Secretary General Ban Ki-moon and the head of the Organisation of American States Jose Miguel Insulza, as well as the presidents from Brazil, Argentina, Peru and other countries, are gathering in Havana on 28-29 January for the summit of the Community of Latin American and Caribbean States (Celac). They are set to discuss ways to combat poverty, hunger and inequality in the region. But alongside the official gathering, pro-democracy activists were planning to stage their own summit without the authorisation of the Cuban government. The Cuban dissident blogger Yoani Sanchez complained they were being watched by the authorities and reported police intimidation ahead of the Celac meetings. "The political police have intercepted my husband @rescobarcasas [Reinaldo Escobar] outside the house to threaten him about #CumbreCELAC", she said in Spanish on Twitter, referring to the summit. Jose Ferrer spent eight years in prison after a major crackdown on opposition activists in 2003, when the authorities arrested 75 opponents of the government. 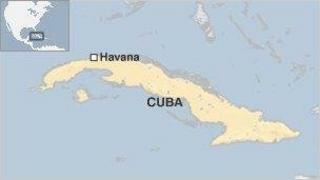 The mass arrests, which became known as Cuba's Black Spring, provoked widespread international condemnation. The European Union called off co-operation with the island, which was only officially resumed in 2008.